Dragon holds the fifth position in the Chinese Zodiac. The birth years of the Dragon are : 1928, 1940, 1952, 1964, 1976, 1988, 2000, 2012, and 2024. The following are the twelve zodiac signs: Rat, Ox, Tiger, Rabbit, Dragon, Snake, Horse, Sheep, Monkey, Rooster, Dog, Pig. The New Lunar Year comes with a lot of responsibilities, with discipline, organization and a very rigorously planned and enforced lifestyle. The Year of the Pig 2019 can also bring unexpected changes, nonconformist ideas, and spectacular career changes. The sentimental life gets free from any tensions and restraints, thus the Dragon natives are relieved from this point of view and they can again express themselves freely, and they are ready now to make serious commitments. Wood Dragon 1964 You will be lucky in love this year ! Fire Dragon 1976 Follow your ideal in life ! Metal Dragon 1940, 2000 You will put it in order your most problems ! Earth Dragon 1928, 1988 In 2019 reinvent your professional life ! Water Dragon 1952, 2012 You will be more preoccupied with your career this year ! In the Earth Pig Year of 2019, the Dragon will have a promising career. Those born under this Chinse zodiac sign will be able, more than ever, to use their analytical skills for strategies to complete their projects during the Pig Year. The Year of 2019 presages for the Dragon natives that all challenges occurring during the 12 months of this year will be easily solved with intelligence and expertise. The business will excel, especially in marketing and sales, foreign partners (even from other countries) will get involved with you in commercial activities. Remote trips for business are also welcome for the development of the business area. Those born under the Dragon sign need to organize their financial situation and focus on financial balance and a better accounting. Between March and May of 2019, your monetary (financial) situation will improve, with benefits both from inside and outside, and you are going to have a substantial positive budget. Which is going to be profitable in the future. However, the Dragon natives should be cautious in terms of spending money. Futile expenses need to be carefully kept in check. In 2019, Dragon natives can find love also during the social interactions or even during the meeting with the work colleagues. Because you wish to keep your existing relationship, you will need to make some compromises during May. It is possible to receive some news regarding a pregnancy during this period. It is good, in this regard, to carefully check your 2019 Feng Shui zone. The Dragon sign is compatible with the Monkey and the Rat natives. Some of the best compatibilities from the Chinese zodiac are between these signs. In the Earth Pig Year, the Dragon is not compatible with the Dog.Give yourself some space and your relationship is going to be pleasant. Therefore, restriction of freedom and excessive criticism are matters that you should pay attention to otherwise, you’ll have no chance together. 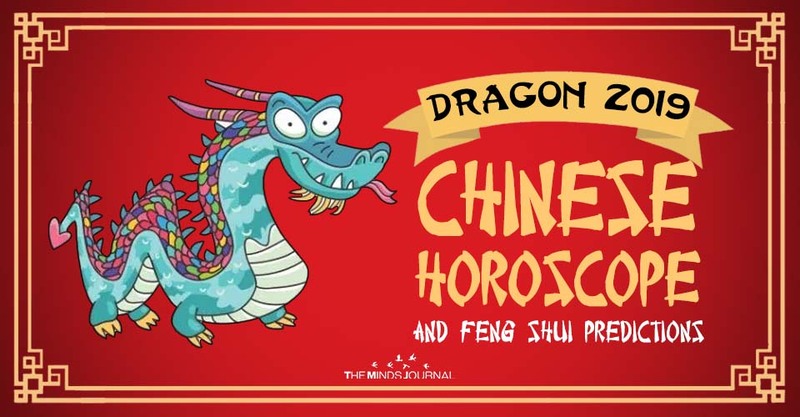 The Chinese horoscope foresees for the Dragon natives an excellent state of health at the beginning of the Earth Pig Year of 2019, which is going to give them enough physical resources for the rest of the year. However, although you don’t want to, you should take some breaks from work. The Chinese Horoscope 2019 recommends to take as many breaks as possible and to take time off to relax all throughout the year, whenever you have the chance. Starting in April, you need to be more careful about your health and it is a good idea to make time, periodically, for physical and mental recovery. You are going to have the opportunity to go on relaxation trips to special locations to restore your morale. It is necessary to have a balanced diet during this period, together with your life partner. Because the office is associated with professional success, keep the money in the Western side of your office, and, in the East, set a plant that can permanently oxygenate your brain so you can make money with your creativity. A Feng Shui remedy for 2019 is a Medicine Buddha, which is a well-known remedy for health, happiness, and joy. Medicine Buddha has the power to heal and ward off diseases. It is used as a remedy for the flying star 2 – the diseases star. It always includes something blue, since it is a water element. Love: The recommended remedy for the Dragon natives for 2019 are the Mandarin Ducks.Place this remedy in your home and you will have a peaceful, long, and harmonious life. The fan protects against those who are jealous on your relationship and helps you repel the murderous chi sent in your direction by those who are envious of your happiness.